Oil and gas refineries are among America’s most dangerous work sites. With hazardous chemicals, heavy machinery, and highly flammable liquids and gases everywhere, any accident can quickly turn into a life-threatening disaster. Crush injuries. Refinery workers can be crushed by heavy equipment or by falling debris in an explosion. These accidents can lead to internal organ damage, broken bones, head and brain injuries, or even death. Lung damage. Refinery employees are routinely exposed to harmful emissions, and workers risk breathing in hazardous fumes. This can cause serious respiratory problems, and even lung disease. Burn injuries. Refinery equipment, operating at high temperatures, combined with extremely flammable substances can quickly lead to a raging fire. These fires can be difficult to extinguish, and they can result in severe burns, scars, and disfigurement. Hearing loss. Refinery equipment is often extremely noisy, and long-term exposure to this audible assault can lead to chronic hearing loss. Sudden explosions may also cause acoustic trauma, when noise from the explosion damages the hair cells and the auditory nerve. Lacerations. Falling or exploding debris can cause severe cuts or lacerations. These are very painful, and frequently result in permanent scarring. Traumatic brain injury. Experiencing a serious fall or being buried under falling debris due to an explosion can lead to traumatic brain injury. This condition can leave a victim in a long-term unresponsive state, requiring years of rehabilitation. Orthopedic injuries. 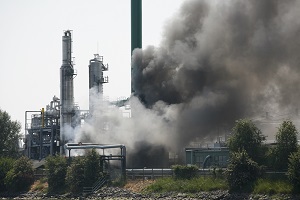 The initial blast of a refinery explosion can result in broken bones, damaged vertebrae, skull fractures, and sprains and strains. Toxic exposure. Refinery workers are routinely exposed to many toxic substances, such as ammonia, formaldehyde, and methanol. Long-term exposure to these chemicals may cause workers to develop serious health conditions, including cancer, neurological disorders, and lung disease. If you’ve been injured while working at an oil or gas refinery, you need an experienced attorney to help you receive the compensation you deserve. To learn more about what the law offices of Steve M. Lee, P.C., can do for you, visit us on Facebook.